Rachel Alexandra fan day finally arrived! 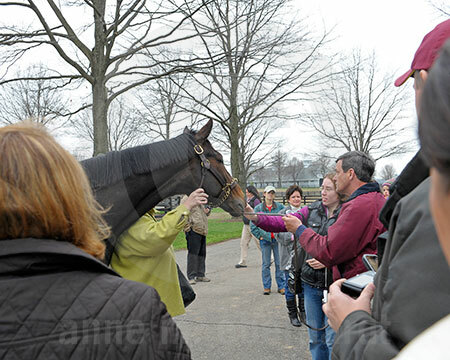 Fans like me had signed up on Facebook in February to visit the Horse of the Year during one of four sessions planned for March 25, 2011. Rachel Alexandra, owned by Jess Jackson and Barbara Banke, now resides on their Stonestreet Farm near Lexington, Ky. The Stonestreet staff was organized, friendly and accommodating—answering questions and welcoming everyone on this special day. Upon arrival we went to the office where photos and magazine covers of Rachel hang on the walls. Her trophies were on display with continuous video of her races. Fans signed their names on a board surrounding her photo. 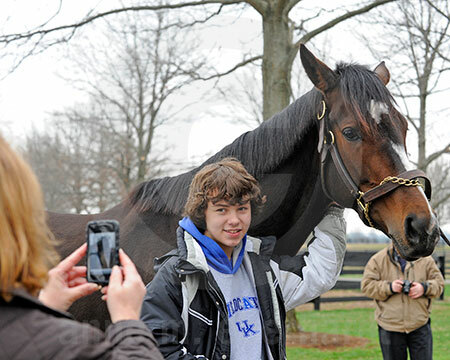 Next, shuttles took fans to Rachel’s barn where she stood for us to pet and take photos. She was relaxed and moving her ears, alert to all of the 25 visitors around her. We passed our cameras to each other so all could have a photo taken with the champion. Her handler let a fan give Rachel a treat and he mentioned that Rachel and her paddock buddy, Hot Dixie Chick, always are together as they graze in their field. Back at the office, fans were treated to drinks and food and presented with chocolate horse head cookies with Rachel’s signature blaze in white cream, plus a photo of Rachel. Fans had been waiting to see Rachel since her retirement and the wait was well worth it. View the full slideshow to see more images from my trip to the Rachel Alexandra Fan Day. Be sure you take a minute to check out this video too. Also, if you haven't had the chance yet, make sure you check out the images of Rachel’s full sister that I posted last week. She lives just down the road from Rachel at Dede McGehee’s Heaven Trees Farm. 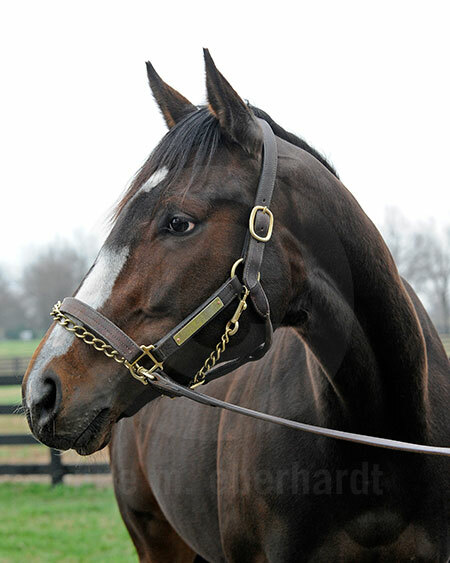 View images of Rachel Alexandra's full sister. Plus, I will soon be planning my next few visits for the blog. You guys let me know who you would like to see next and I will see what I can do. Thanks everybody!